Type location Za飏e (Wheeler, 1922: 147, illustrated, worker); worker only described (see Bolton, 1995) . WORKER - length 6 to 7 mm. Of rather uniform stature and closely resembling eumenoides (M. natalensis) but a little more elongate. Head relatively smaller, as broad as long, excavated behind, convex above, flattened below. Mandibles 5-toothed. Clypeus ecarinate, with entire anterior border. Eyes somewhat larger and more convex than in eumenoides. Thorax very similar but promesonotal suture very distinct, impressed, the mesonotal lobes less compressed, their posterior outline in profile less abrupt, more sloping so that the metanotal groove (mesoepinotal impression), though deep, is shallower and less acute than in eumenoides and appears longer. Propodeal spines longer, slightly sinuous, with very feebly upturned points, directed backward and slightly outward. Base of propodeum (epinotum) longitudinally concave. Peduncle of the petiole longer than the node, which is thick and evenly rounded, not compressed laterally above. The ventral surface of the petiole armed below with two long, delicate hyaline spines, which curve towards each other and enclose an elliptical space. Postpetiolar node of the same size and shape as that of the petiole, its ventral surface straight in profile, not bulging nor angulate in front. Gaster and legs of the usual shape, the former with a straight, anterior border. Shining; mandibles coarsely longitudinally striated; clypeus smooth in the middle, with a few rugules on the sides. Rugosity of head, thorax, and pedicel much as in eumenoides but the rugae on the dorsal surface of the head and thorax less numerous and less pronounced, without distinct anastomoses; sides of the head with finer and less distinct rugulae, so that the surface is more shining. Gaster opaque and very finely punctate only at the extreme base above, otherwise shining. Legs and scapes shining, finely striate. Hairs dark brown, in length and arrangement much like those of eumenoides. Reddish brown; gaster brownish yellow; legs, including the coxae and lower pleurae, darker than the thorax. Mandibular teeth and antennae blackish. This form is so closely related to eumenoides that it might, perhaps, be regarded as a subspecies. It is easily recognized by the unique ventral appendages of the petiole. These are so brittle that they are easily broken off, but their basal insertions on the low hyaline lamella in the midventral line of the petiole are usually discernible. Evidently salambo is also related to M. striata Stitz, specimens of which I have not seen. The photomontage of cotypes is collated from The Smithsonian Institute images at http://ripley.si.edu/ent/nmnhtypedb/public/specimeninfopage.cfm?publicconsumption=1&typespecimenID=1125. BT Note: the specimens shown in the photomontage show no signs of the subpetiolar appendages. The overall set of features, however, does appear to be distinctive, e.g. the squarer head, thicker funiculus segments and the pale gaster, compared with M. natalensis. The workers from Senegal, shown, below, however, do have the subpetiolar processes, as well as sharing the other described features. This does show the subpetiolar processes. 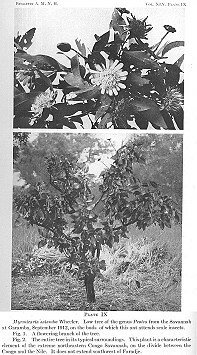 Described from numerous specimens taken at Garamba, Za飏e (Lang and Chapin) attending scale insects on the buds of a Protea (see illustration left and "click"). The photomontage is of a worker from Senegal, Bambaraya; collector B Ndiaye. This clearly exactly matches the Wheeler (1922) description and the photo above.